After night bus from Hannover to Paris and going through various subway station we reached our first destination – Louvre Museum in the morning. The whole place was packed with tourist. There was a large queue for getting into Museum. The temperature was high so our travel plan 😛 After the time had come, we first went to see the most famous the Leonardo da Vinci Mona Lisa Painting at the Louvre. 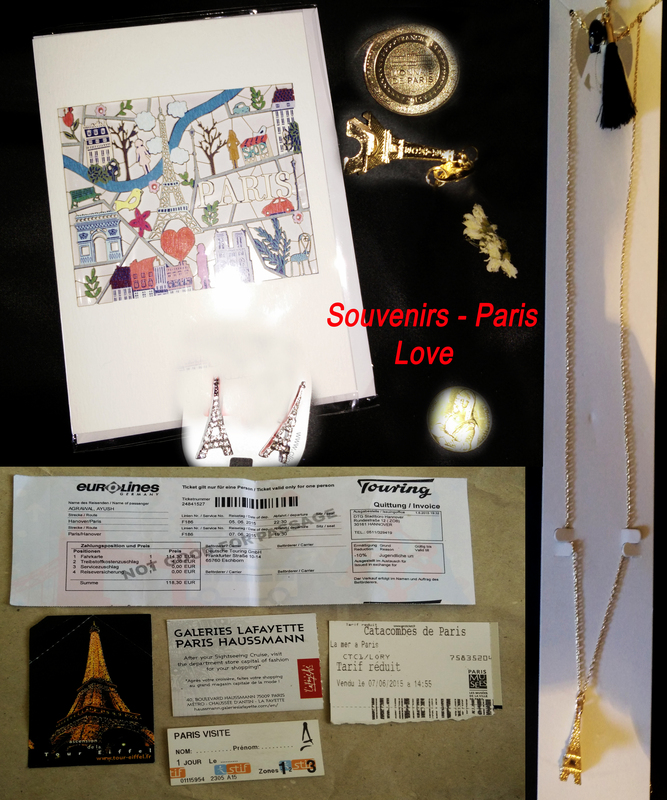 Yes, the original one 😀 There I bought the souvenir (Mona Lisa Coin) in the Carrousel du Louvre in Louvre. The museum’s collection gathers works from prehistory to 1850. The glass pyramid entrance with modern interior design enhances the appeal of all the ancient relics displayed inside. I would recommend concentrate on the main collection to discover the greatest works : the Venus de Milo, the Coronation of Napoleon I, Leonardo da Vinci’s Mona Lisa as we need two days to see all . After that we were tired but we were in the most love place in the world so we decided to have a walking tour started from Museum to the main monument Eiffel Tower . This was our path in the romantic place. 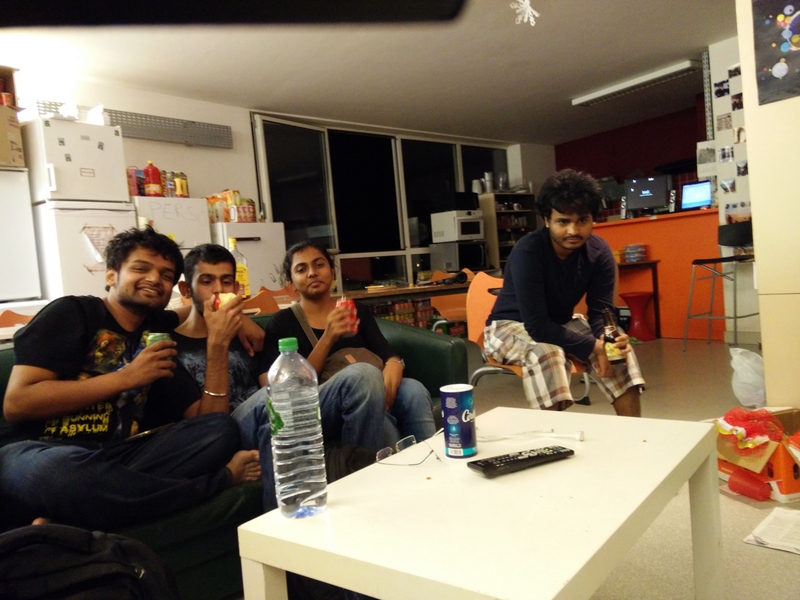 After that we decided to have some rest. 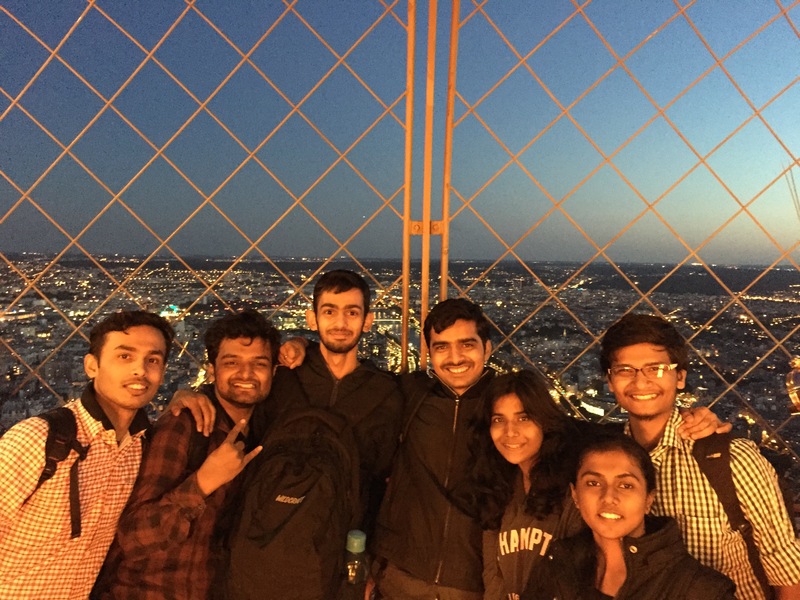 We came into contact through a friend with an Indian student in Polytechnic University in France which helped us to stay with him in the night. Thanks a lot for that friend otherwise we had to spend our another night in McDonald 😛 Again!! In the morning we planned to go to Palace of Versailles just outside Paris so hopped on a train. It was really awe-inspiring to see the magnificent golden gate. 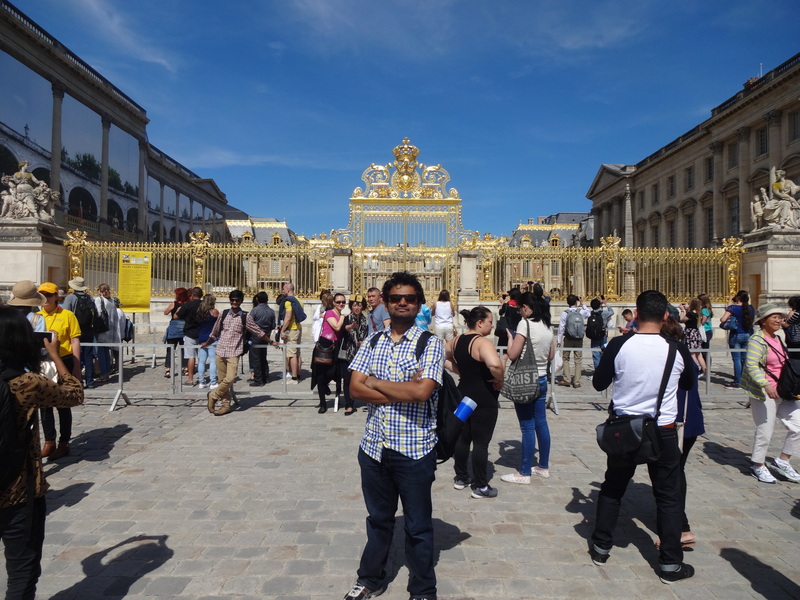 Versailles is best known for the massive royal palace and expansive gardens built by King Louis XIV. But to go inside we had to pass through a long queue so skipped. Then we explored the local markets near it and experienced a street show. 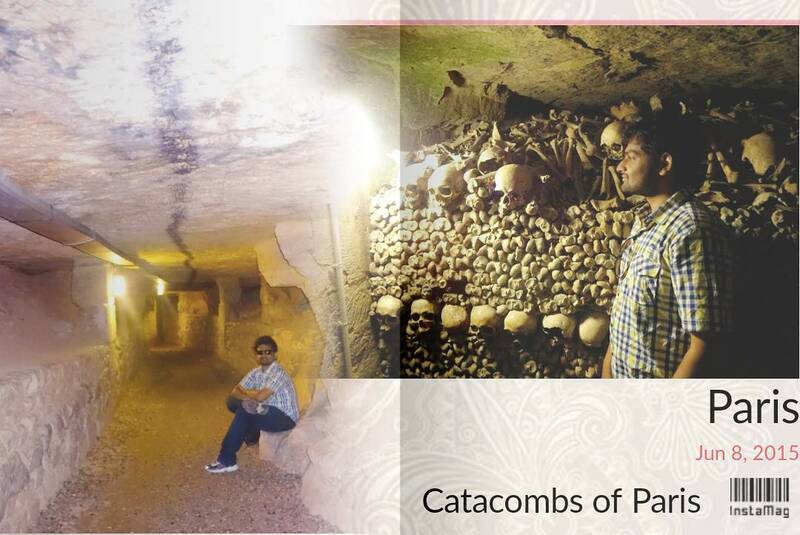 Then we went to underneath the city of Paris in the tunnels checking out the bones of real people who died long before. No one knows how many tunnels or chambers are out there which have been sealed off but there are secret ways in from the sewers but one is open to the public. We arrived at a big line up waiting at the entrance to get in. As it would be a spooky fun so decided to wait. After getting inside it was strange, quiet, dark, and depressing. The catacombs are the artistic tribute to the dead arranged into shapes of heart or pillars. It was really good to feel relax on the boat in the Seine River which stretches a long way in Paris. We got great knowledge of structures – Statue of Liberty of Paris, the Place de la Concorde, the Eiffel Tower, etc. We saw couples attach a Love lock to the Pont des Arts and throwing the key into the river symbolizing love. The Seine River is an integral part of life in Paris thus cannot be missed by any traveler 🙂 Then we were in the rush as had to pass various tram stations to reach outer of Paris for the bus to Hannover. Visited underneath the city to see real bones.